If you have found this page you've obviously followed the link from Outsider Magazine. For the first person that got this far, which was Tim Kosykh, he has won a gift voucher, for two people, for the below choices. This competition is now finished. These vouchers from our tinyurl advert link are now finished. Voucher cannot be redeemed for money. Voucher cannot be exchanged for other trips. Not redeemable on Bank Holidays and other certain dates. Sea Kayaking around Cod's Head, on the Beara Peninsula. 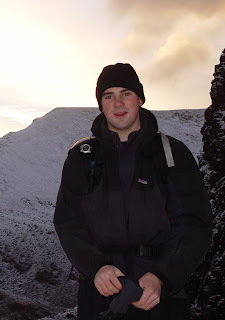 Last Saturday I had one person for a day of Mountaineering Training. We spent the day on the steep flanks and high ridges of Mullaghanattin, deep in Glencar Valley. Over the day we looked at Navigation, Moving on Steep Ground, Rope Work and Emergency Abseiling. As it got dark we got out our head torches and compasses and did some Night Navigation. Yesterday I was on Howling Ridge, on Carrauntoohil, with one client. Howling Ridge is one of the best mountaineering routes in the Irish Mountains. 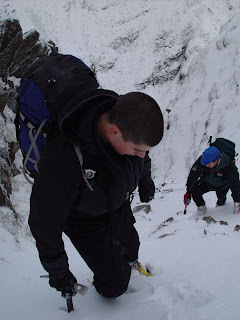 scramble to the summit of Carrauntoohil. We had a cold, clear day, without a breath of wind. From 700 metres upwards there was a thin layer of snow on the ground and the occasional sliver of ice in the rock cracks. We roped together and climbed the route as a multi-pitch climb; placing gear in the rock cracks and attaching the rope to the gear. It took us five hours to climb the ridge, not stopping once we were on it. We descended the mountain the fastest way, using our head-torches for the final hour of walking. On Thurs 28th Dec I'm running a White Water Kayak Trip, probably on the Lower Caragh or Lower Flesk; which are both brilliant Grade 2+ Rivers. 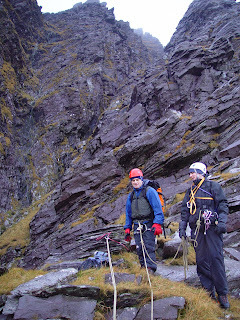 Today I had two clients, Eric and Barry, who wanted to do a day of scrambling on Carrauntoohil. Gale force winds were forecast from lunch onwards, so we had an early start. The road to Lisleibane is now officially a river bed! Lots of white, raging streams rushing from the high corries as we walked into Hags Glen. We grabbed an early lunch part way up O’ Shea’s Gully, then put on harnesses, helmets and a rope and scrambled up Curve Gully. Curve Gully is a narrow, steep gully, which curves up and around the north face of Carrauntoohil. It’s a mixture of loose scree, grassy slopes and several rock steps. As we climbed up we could hear the wind whistling and wailing over the top of the steep walls. Reaching the top of the gully we climbed out into a buffeting wind and hail. The summit only thirty steps away. Right on 1pm the wind really picked up. Fair play to Met Eireann, very accurate forecast! At this stage we were heading down the easiest way - Devil’s Ladder - and were back at the cars for 3pm. Teaching Multi Pitch Climbing on the Old Head of Kinsale, last week. A winter's day in the MacGillycuddy Reeks, in Kerry, last January. Thank you Tony, for building my website and also thanks a million to Deirdre, who gave me a huge amount of invaluable advice.